Thank you to everyone who submitted feedback for the Tom Bihn bag giveaway. I'm a few days behind on announcing the three lucky individuals who get a free Tom Bihn Bag. Congrats to John Z., Tim M. and Javier S. Look for me to give away more cool stuff in the near future. One of the most interesting parts of the survey for me was seeing what you are or aren't using to make audio and video. As a percentage of total responses, more people are not currently using audio and video editing software than any one specific software application. To keep things simple I lumped any audio or video editing app with only one person using it into the Other category. Below you can see a breakdown of which apps are most popular with people who responded to the survey. 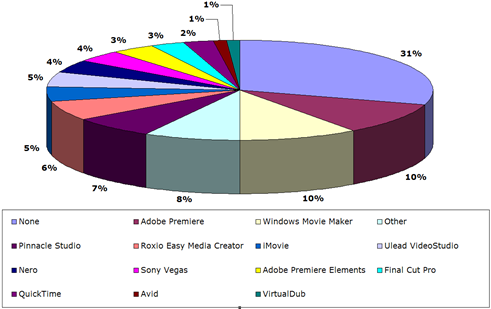 Adobe Premiere and Windows Movie Maker are the two most popular video editing applications in terms of usage by respondents. 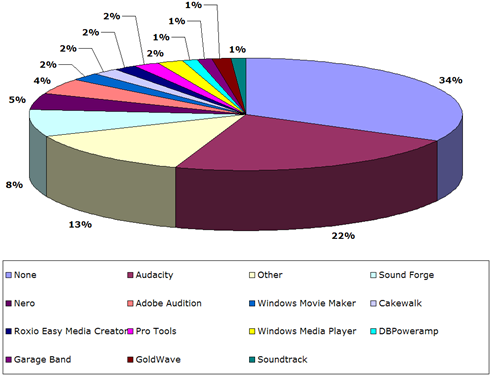 For audio editing, Audacity is the runaway favorite among respondents with 22%. Sound Forge is the next closest application with 8% of respondents. I think I may run a similar survey about digital photography apps in the near future to get a better feel for what you might be using to tweak your photos. In other freebie news, it's taken forever but I finally have the two recipients of an iRiver Clix and MTV URGE worked out based on my server stats. In case you've forgotten what this was all about, if you linked to an article on JakeLudington.com between July 19, 2006 and August 29, 2006, you were automatically given a chance to get a free iRiver Clix from me. The person who generated the most traffic from their link (or links) got an iRiver Clix and MTV URGE and one random individual also would get an iRiver Clix and MTV URGE subscription. Sorting through all the details proved to be more complicated than anticipated. As it turns out, Gina Trapani over at Lifehacker came in first with over 8588 people visiting, so Gina came in with the top traffic by a very wide margin. Jay White's Dumb Little Man was selected at random from all linking sites.